When there is an update, you will normally get a notification show up in your site’s dashboard for any themes and plugins you have installed. For themes from us, you will receive notification just like the standard WordPress method. There are a few ways to update your theme, so we will outline each one below. This is by far the easiest method because it’s just one-click. However, this depends on if you’ve setup your license key and added your website to your license key as well. Doing this will allow you to receive auto updates. …Click on the Update now link. To confirm you are updated, check the Theme Details and see if your version number has increased. For anyone comfortable using an FTP (File Transfer Protocol) program, you can upgrade the theme by manually uploading your new theme. The FTP method is a good method if the auto update failed, or if you are unable to log into your WordPress dashboard. This is also a great way to learn how to use FTP because there will be times when you need to use it. It gives you hands on management of your site files. Log into the ChildThemeStyles.com website and get your theme download zip file (for the new version). Double click the zip file to extract (sometimes referred to as unzip) the latest theme zip on your local computer. This process creates a folder on your desktop the same name as your theme; where your theme files are located, such as the style.css file. Navigate to “/wp-content/themes/” which is where your themes are located. 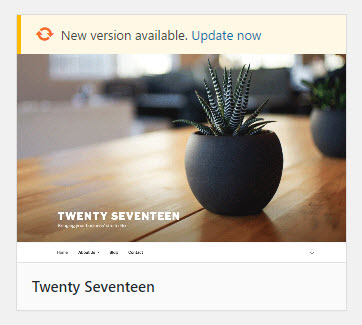 You will know when you are there because if you still have a default WordPress theme installed, such as Twenty Seventeen, you will see a folder named twentyseventeen. Before you replace any files or folder on your server, we recommend to download a copy of the current theme folder to a safe location on your computer as a backup. Then upload your new theme folder to replace entire theme folder. For example, if I downloaded the latest version of Twenty Seventeen, extracted it to give me a folder named “twentyseventeen“, I would upload that folder to the /wp-content/themes/ so that it overwrites the existing “twentyseventeen” folder. If you did not modify any theme files, it’s safe to delete and then reinstall the theme without losing the theme settings and content. You may use the WordPress theme installer to delete and then install the latest version of your theme by uploading the zip file like any new theme install. IMPORTANT: I recommend you always make site backups before updating themes, plugins, and especially WordPress. Always expect the unexpected. Log into the ChildThemeStyles.com website and then go to Members >> Purchase History >> View Details and Download. Download the new theme zip. Log into your website’s admin area (dashboard). Temporarily activate a different theme (I recommend a default WordPress theme). Now go to the Theme Details for the theme you will be updating and click on the “Delete” button to remove the theme. Then click on the “Add New” button at the top and then click on the “Upload” link, upload the latest theme zip and activate it. This is the same method as the Installing themes tutorial. There is a very convenient plugin called “Easy Theme and Plugin Upgrades” that offers a fast and easy way to update and backup your theme easily. IMPORTANT: As usual, we strongly recommend you ALWAYS make a full site backup before updating plugins, themes, and especially WordPress. Log into your site’s admin and go to Plugins >> Add New. Do a search for the Easy Theme and Plugin Upgrades plugin. Activate the plugin on your site and make sure you read the developer’s documentation first. Log into the ChildThemeStyles.com website and go to the Members >> Purchase History >> View Details and Download. Download the latest theme zip to your desktop. Go back to your site’s admin dashboard and then Go to Appearance > Themes. Click the file browse button to select your theme zip file. 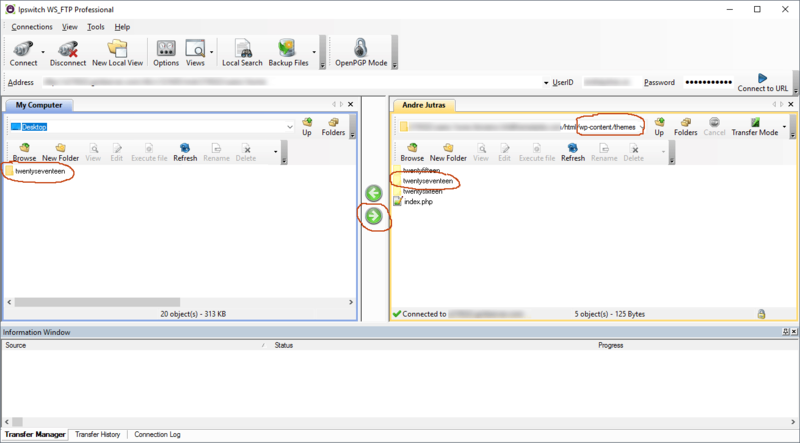 Select the theme’s zip file that you downloaded (this will be the latest version) and upload the new theme file.